Growing construction activities, establishment of business hubs & industries and infrastructure development have resulted in the expansion of power infrastructure, which have amplified the demand for medium voltage switchgears across all GCC region. Global events like World Expo 2020 and FIFA World Cup 2022 would also fuel the switchgear business in the region. The growth of medium voltage switchgear market is primarily driven from massive investments in non-oil & gas sector by the GCC countries to diversify their economies. According to 6Wresearch, GCC medium voltage switchgear market size is projected to reach $1.39 Billion by 2023. Development of smart grids and establishment of nuclear and renewable energy power plants would spur the demand for medium voltage switchgear in the forecast period. Over the next six years, the commercial and infrastructure & transportation segments would drive the GCC medium voltage switchgear market forecast revenues over the coming years. Amongst all the applications, the power utilities accounts for major share in the overall GCC medium voltage switchgear market share. Commercial, infrastructure & transportation, industrial are the other key revenue contributing segments. The GCC medium voltage switchgear market report thoroughly covers the market by insulation, applications and by country. 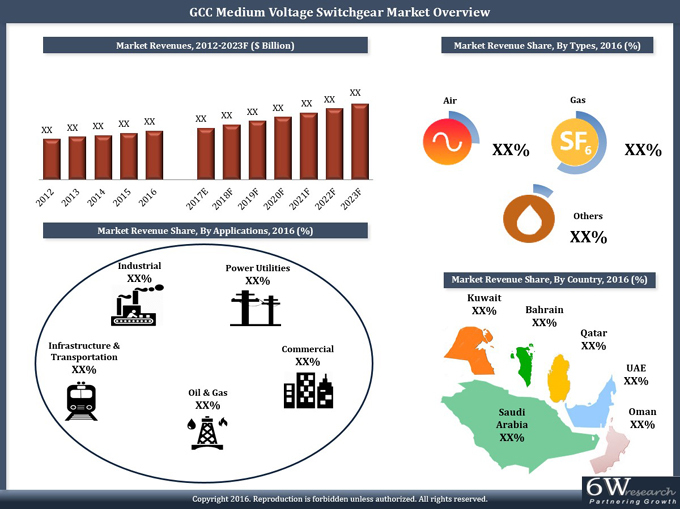 The GCC medium voltage switchgear market outlook report provides an unbiased and detailed analysis of the GCC medium voltage switchgear market trends, opportunities/ high growth areas, market drivers, which would help stakeholders to device and align market strategies according to the current and future market dynamics. 31.2. Al Ahleia Switchgear Co.